ID CardWorld supplies a complete range of Badge Holders and ID Card holders to suit your requirements in either portrait or landscape styles. Whether you need Single sided holders, Dual sided holders, Multi cardholders or Lockable cardholders we have the cardholder for you. 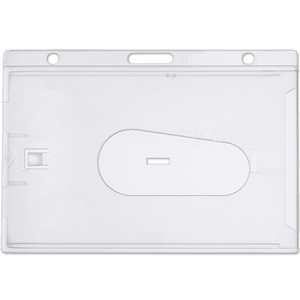 ID Badge Holders help to protect your ID cards from dust and contaminants increasing life expectancy of the cards and also help to keep them secure. ID Cardholders may be used in conjunction with our range of ID Clips and lanyards for professional visible security. We also supply a range of Lockable cardholders designed to help keep your Proximity cards safe. Need help choosing? Please call our sales team on 02 9651 6000 or use the enquiry form. Note: Holds 1 standard ISO card and one clamshell access card.